A new paper, published online in Nature this week, aims to resolve long-standing disputes within Arthropod phylogenetics. This work offers strong evidence for, and opens new, perplexing questions about, the deep evolutionary history of arthropods. Chelicerata – Arachnids, horseshoe crabs, sea spiders. Crustacea – Crabs, lobsters, shrimp, copepods, ostracods, barnacles, pill bugs, brine shrimp, water fleas, remipedes, ect. Hexapoda – Insects, silverfish, springtails. All known arthropods are included in these subphyla. However, the interrelation of the subphyla has long been in contention. 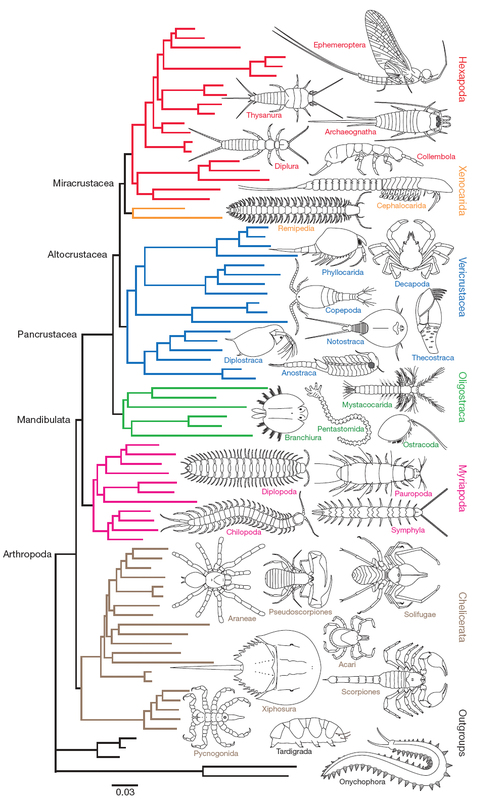 Up to now, a series of morphological and molecular-based classification paradigms have been employed to parsimoniously resolve the deep phylogeny of arthropods; with mixed results. 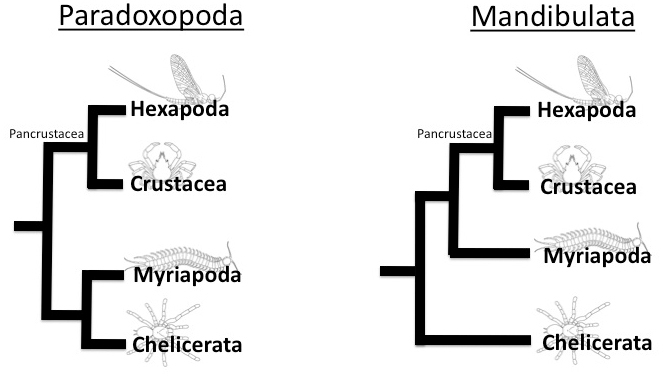 Two of the competing hypotheses of deep arthropod phylogenetics are the Paradoxopoda and Mandibulata models. Both Mandibulata and Paradoxopoda propose a Pancrustacean clade consisting of Hexapods and Crustaceans as closely related sister groups. They differ in their treatment of the Myriapods and Chelicerates. Paradoxopoda has Myriapods and Chelicerates as closely related sister groups. Mandibulata, on the other hand, has Myriapods as a sister group to Pancrustaceans, and Chelicerates as a distant, early-branching clade of arthropods. While Mandibulata is supported by taxonomy (Crustaceans, Hexapods, and Myriapods all have mandibles, where as Chelicerates have chelicerae for mouthparts), Paradoxopoda is primarily supported by recent mitochondrial molecular pylogenetics. Also under contention is the relationship between Crustaceans and Hexapods within the increasingly well supported Pancrustacean clade. It has not yet been settled if the two are distinct sister groups, or if the Hexapods are nested within the Crustaceans. If the latter is true, researchers have not been able to determine which branch of the Crustaceans gave rise to the Hexapods. In the present study, researchers at University of Maryland, Duke, and the Natural History Museum of LA have dramatically improved on previous molecular approaches for inferring deep arthropod phylogenetics. They did this by increasing the number and diversity of arthropod species included, as well as the type and amount of genetic sequence characters used. Whereas previous approaches used mitochondrial genetic sequences, resulting in the morphologically perplexing Paradoxopoda model; the researchers in this study instead used nuclear protein-coding genes. Nuclear genes have been increasingly used to resolve deep evolutionary relationships in animals. Maximum likelihood phylogenetic tree of arthropods. Adapted from Regier et al., 2010. This tree further supports a Pancrustacean clade consisting of Hexapods and Crustaceans. 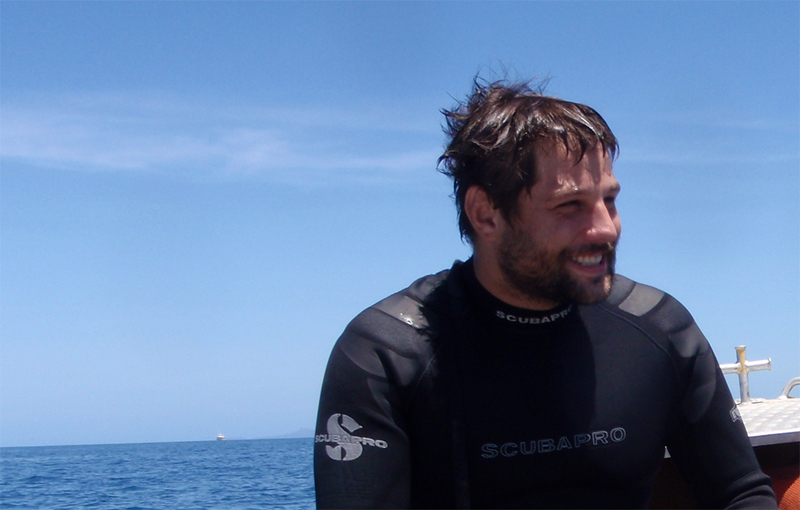 In addition, this work supports the Mandibulata model of deep evolutionary relationships within Arthropoda. Pancrustacea is sister to the Myriapods, forming the Mandibulata clade; which is then sister to the early-branching Chelicerates. This reconstruction strongly refutes the mitochondrial Paradoxopoda model. The most notable results of this study are in regard to the internal structure of the Pancrustacean clade. Instead of a distinct separation between Crustaceans and Hexapods, we see four resolved clades within Pancrustacea. The Hexapod clade is upheld and nested completely within Crustacea. In addition Crustaceans are split into three paraphyletic clades; Vericrustacea, Oligostraca, and Xenocarida. Vericrustacea (‘true crustaceans’) includes the decapods (crabs and lobsters), mantis shrimp, barnacles, copepods, and branchiopods; most of the critters commonly thought of as crustaceans. Oligostraca is a strange and early branching crustacean group that includes ostracods, tongue worms, and branchiurans. Xenocarida (‘strange shrimps’) includes remipedes and cephalocarids. It turns out that, according to this analysis, the Xenocarids are the long sought-after sister group to Hexapods. Together they form the new clade Miracrustacea (‘surprising crustacean’). The Miracrustaceans are sister to the Vericrustaceans, forming a clade that is in turn sister to the Oligostraca, rounding out Pancrustacea. This study causes some serious upheavals in the Pancrustacean clade; breaking Crustaceans into three paraphyletic clades, placing remipedes as close sister taxa to Hexapods, and nesting the Hexapods completely within the Crustaceans. At the same time it presents new and exciting questions to morphologists and evolutionary-developmental biologists. Further morphological, genetic, and evolutionary study is required in order to understand the full implications of these newly resolved arthropod relationships. However, this research represents a robust step forward towards unraveling Arthropoda.